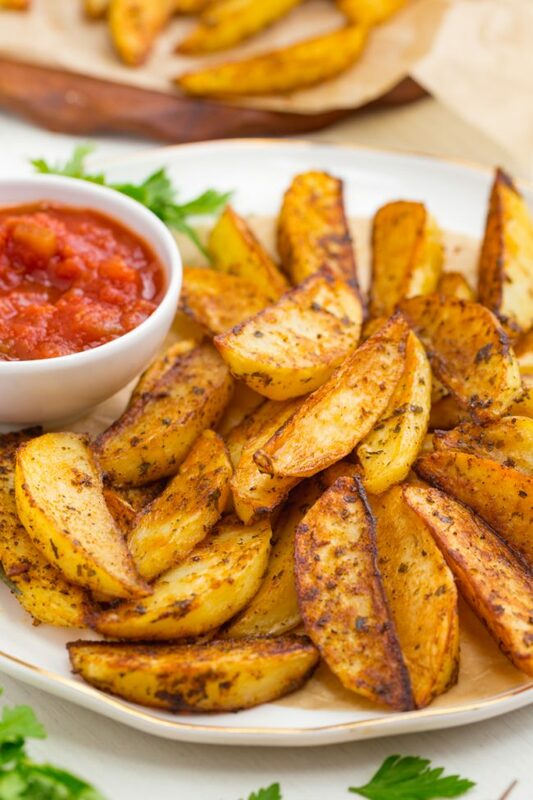 This potato wedge recipe is easy, spicy and a healthy alternative to French fries! They’re perfect alongside almost anything and great for parties and barbeques. I love roasted potatoes. They’re so versatile. You can use up fresh herbs on them or throw in the dried stuff. I’m usually pretty lazy and just use salt, rosemary and garlic powder, but I also like them with a kick, which is the version I’m sharing today. After I made these homemade potato wedges for the first time, I made them again, but made 10x the amount for the spice mix so that I could have the mix handy whenever I’m craving potatoes. It really saves time! Once you have the mix, you just cut up the potatoes, add olive oil and the spices. Done! I like to let these potato wedges sit for about 10 minutes after taking them out of the oven. They get a little softer, both inside and outside. And the spices are a bit less intense then, which I like. I’ve made these for several parties and other people don’t seem to mind them at all when at room temperature. They’re always one of the first items to go. The only thing kind of annoying about them is that I can’t make them quick enough. They get eaten way faster than I can cup up the potatoes and roast them! Unfortunately, they’re not something you can cook ahead of time (however, you can cup up the potatoes, put them in a bowl and cover with water!). These potato wedges aren’t any good reheated, so eat them up while still warm or room temperature! 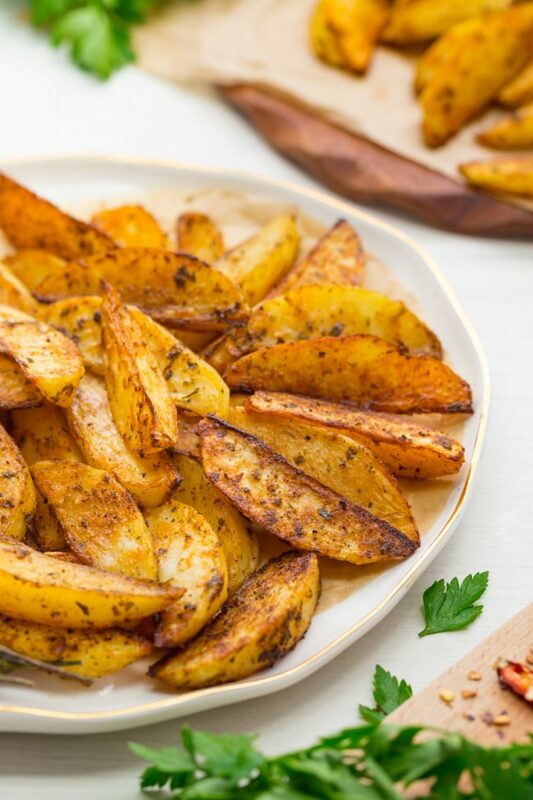 If this recipe sounds too spicy for you, try these roasted Greek potatoes! They’re one of my favorites. Wondering what to pair them with? This pecan-crusted salmon is a winner! Preheat the oven to 450 °F (230 °C). Pour the olive oil onto a rimmed cookie sheet. Add the spices and mix with the olive oil. Some people prefer to mix the oil, spices and potatoes in a bag but I prefer the other way as it doesn't dirty up a bag. Clean the potatoes and slice the potato into even wedges. Put the potatoes on the cookie sheet and use your hands to coat the potatoes with the olive oil mix. The baking time will vary depending on how big your wedges are. I usually bake mine for 20 minutes, take them out of the oven to flip them, and bake for another 10 – 15 minutes. If you want them crispier, bake them for a few minutes longer. Eat immediately or at room temperature. 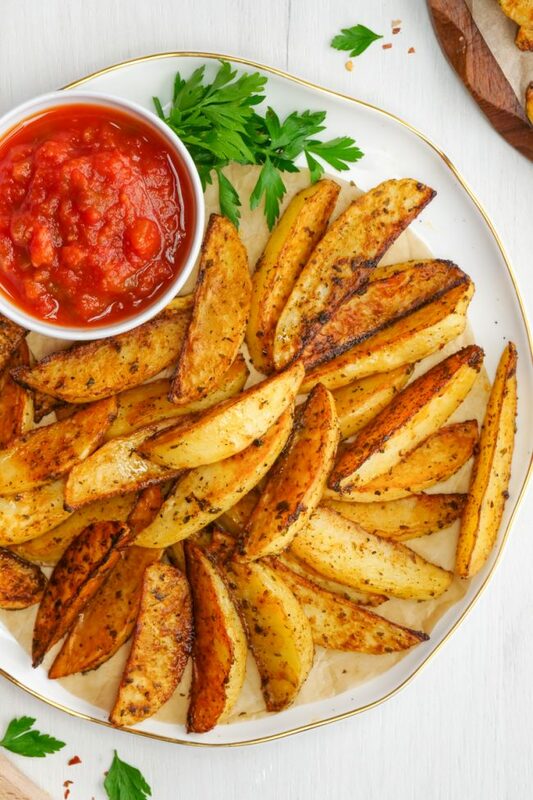 86 comments on “Potato Wedges Recipe (naturally vegan, gluten-free)” — Add one! We are all potato heads in this fam. :) These look SUPER! 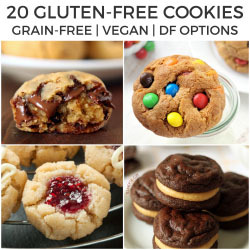 I absolutely love all of your recipes and I share them with my granddaughter who has been vegan for a few years. And I cook for a few people every month and they also love your recipes, I slightly make some changes to the recipes at times…..thank you so much. Potato wedges are a favorite in our home! We make them at least once, sometimes twice, a week. Love the spices you used. Same here! Definitely a favorite. I am a potato-a-holic. This sounds perfect for satisfying my spud craving! I hope you can try them! Any idea how long and what temp to use in an air fryer? :) want to try this with sweet potatoes! thank you!! I could eat potato wedges every day! These look delicious! Hello – these look so tasty! Do you have a certain type of potato you usually use? I never know which ones to use for what!! I actually don’t! I live in Germany and I don’t even know what kind of potatoes we have here. I know that we don’t have Russet potatoes but I think those would work fine! I have used Yukon Gold with good results. Sweet potatoes are another option. Oh my goodness, these potato wedges were such a big hit when I made them for my husband. We took your advice and devoured the whole batch when they were hot! This recipe is definitely a keeper! Thanks! Hi there! I’m so happy that you and your husband enjoyed them. :) Good call on eating the entire batch hot! Thanks for your feedback. I loved this recipe!! I like things a little extra spicy, so I added a teensy bit more cayenne. Thanks for this recipe! INSTEAD OF PUTTING THE OIL AND SPICES ON THE BAKING SHEET i PUT THEM IN A LARGE ZIPLOC BAG AND PUT THE WEDGES IN TOO THEN SHAKE AND SHAKE UNTIL ALL IS COATED. I know a lot of people like to do that but I hate using a Ziploc for that because it dirties it up so much. And yes, I reuse my Ziplocs. ;) Hope you enjoyed the potatoes! These were a BIG hit at the family dinner! Not a spicy-fan myself, but everyone else is. Dunked in ranch dressing, they were very happy with these potatoes! Yum! That sounds delicious. :) Thanks a bunch for your feedback! Omg. The ranch dressing will definitely be a hit with my picky son. Ty! These sound really good, thanks for this up. They turned out great! Just not as spicy as I expected. As a tip, you sprinkle a little chaat masala on top after they’re done and they taste amazing. You can find chaat masala at most Pakistani/Indian/Desi stores. These are AWESOME! Thank you for the recipe!! Yay! I’m happy that they worked out well for you and you’re welcome for the recipes. :) Thanks for the comment! I made these awhile ago as a starting point for coming up with my own recipe – I always try out several recipes and then pick my favourite aspects of each and do some tweaking! This one worked out best, so I used it as the base and then started experimenting…my boyfriend doesn’t like potatoes (not crisps, chips, fries, boiled, mashed, roasted, wedges – none! )…but he ate these! Not only did he eat the few I asked him to at least TRY, but he went back for more!…and even more! Ate the equivalent of 3 big potatoes! Had very few left over after he, my mom and 3 sisters got to them, but I did reheat some the next day and they were just as good! I tried tossing them in the frying pan and also tried grilling them in the oven – frying works a LITTLE bit better, but grilling is always healthier! Never buying frozen wedges again! These were nicer than any store-bought ones! Love these wedges! Trying to figure out how I can make these for my daughter’s wedding. It’s an away-wedding (of course !) & a 3 hour drive, but I’m determined to do this! I can’t bake them all the day of the wedding & reheating in microwave, while still good, makes them soggy. So if I reheat them in the oven covered with foil would they still be crispy & not dried out? I know I could try this out myself but I wanted your input for any other ideas. Would really appreciate your insight. Thanks! So happy that you liked them! :) Have you ever tried reheating them on a baking stone? That works great for these! They’ll crisp right back up and won’t be soggy or dried out. But the problem is that I’m afraid you’d need a ton of baking stones to be able to reheat them all for a wedding party. The potatoes shouldn’t be piled. If you try it out, good luck! I’m honored that you like these enough to make them for your daughter’s wedding (and congratulations to her!) Sorry for my slow reply – I hope I’m not too late! Thank you so much for replying! Not slow at all. Well, I don’t have a baking stone but, what about spreading them out on cookie sheets — covering them with foil — put them in the oven at 300 F for 5 minutes — take off foil & leave in another 5 minutes. Wouldn’t that work? Would really appreciate your input. Thanks a lot! And wedding is September 6! I think that without a baking stone, they’ll be soggy. :( But you could always try it! I really hope I’m wrong. I just haven’t had the best experience with reheating potatoes without a stone. And sorry again for the slowness! Just got back from a vacation where the hotel had internet issues. As strange as this is going to sound, I recently had the most delicious roasted potato wedges at a hospital cafeteria!!! The second I was done eating them I 1. Wanted more!!! And 2. Needed to recreate them immediately so that I can have them anytime I want! Well, I’m VERY pleased to report that your recipe, while similar in taste…are actually even BETTER! Thank you for sharing the recipe and I love your site as well, very easy to navigate! I can’t wait to try other recipes! Ps- sorry for the multitude of all caps and exclamation points, apparently potatoes get me rather excited! But really, how could they not!!! LOL! Haha. I love this comment. :D I’m so happy that these beat the ones at the hospital cafeteria! :) I hope you’ll enjoy the other recipes, too. Thanks so much for the comment and very sorry for my slow reply! Great potatoes. By the way… They warm up great in the nuwave. Everything warms up great in a Nuwave oven. I have a pampered chef cooking stone. If you get it hot in the oven you can re-heat these to their original yummy state. Works for french fries, fried seafood, too. A pizza stone would probably do the same. I am making this for the 3rd time tonight – – so easy and so good. Thank you for sharing. I have even passed the recipe and your website on to others. I made these last night, they were delicious. I’ve made spicy wedges before, but they were never quite spicy enough for us, these were perfect! Thanks for the recipe, looking forward to trying some of your others too. I’m so happy that you liked the potatoes! I hope you’ll enjoy the other recipes just as much. :) Thanks a bunch for the feedback and the rating! Making these right now they small wonderful very easy to make and will make them again. This is a great recipe for us since we enjoy the “heat”!! One thing I did differently in prep was put the dry ingredients and oil in a gallon zip-lock bag and mixed it up. Then, I dumped in my wedges to coat and let them sit for a while and plopped them out on my foil lined cookie sheet. No mess on my hands!! Sounds like a good change! I’d probably do the same Ziplocs weren’t a small fortune in Germany. ;) So happy that you liked the potatoes and thanks so much for the feedback and the rating! This recipe sounds so good, I am going to make them right now!!!!! Thanks for the picture, the potato’s look so tasty!!! Ill let you know how my potato’s turned out! I made these for dinner the other night, they were great! I didn’t have the parsley, so I left that out. They had great flavor, with just a little kick! Even my 8 year old, who doesn’t like spice ate a ton of them! I absolutely DISAGREE :D with you saying these are NO GOOD reheated!! In the morning I cut them up (the leftovers) and I throw them in a skillet with a bit of butter and cook them until they're golden delicious!! Sometimes I mix them with Scrambled eggs, or crack fried eggs on top… :D Potatoes are so versatile! Eventually. I can date a woman, who would make that with me and fall right in love. Make these all the time – red potatoes work too. I usually mix the oil and spices in a plastic bag and then add the potatoes – not so messy! Just toss the bag after you put on cookie sheet! Aww, that's sweet. :) Thanks for the feedback! I'm happy to hear that someone liked them. These sound lovely! I love trying new potato recipes. Thanks! Just found your blog from Caroline's and it's lovely! I've been a threat to post a "tad" too many "Whole Grain" posts lately myself… so thanks for the reminder & potato inspiration. FYI… we just launched a new food photo sharing site at http://www.healthyaperture.com. I'm sure the editorial team would be honored if you submitted some of your pics. There are a lot of lovely ones on here! 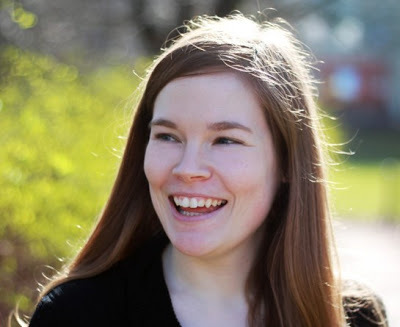 Becca – Me too! Potato wedges ruined fries for me. I'm just not interested in them unless there's nothing else to eat. I love, love, love potato wedges. I would take them over fries any day of the week, any month of the year. These particular ones look very delicious.